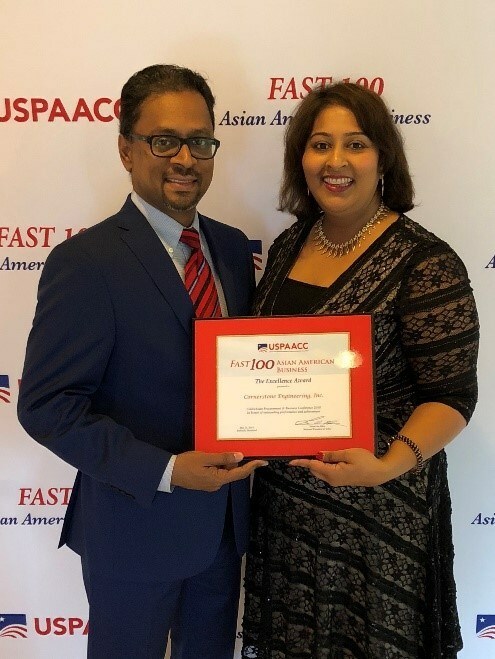 Cornerstone Receives Fast 100 Asian American Business Award for the Second Year in a Row — Cornerstone Engineering, Inc.
Pictured: Chella Subram, President and Susy G. Manimuthu, Manager of Cornerstone Engineering, Inc. Cornerstone Engineering, Inc., a premiere structural engineering consulting firm with offices in Louisville, Indianapolis, Cincinnati and Lexington, has once again been named as one of the fastest growing top 100 Asian-American owned businesses in the country by the U.S. Pan Asian American Chamber of Commerce (USPAACC) for 2018. Cornerstone is headquartered in Louisville, KY and regularly works on projects throughout the Southeast, including with the Louisville Metropolitan Sewer District, Norton Healthcare, and the Louisville Water Company. Regionally, Cornerstone works with Citizens Energy Group in Indianapolis and the Metropolitan Sewer District of Greater Cincinnati. Cornerstone also serves as the Design-Build and Design/Bid/Build contractor on projects around the country that are often on military bases, with the Army Corps of Engineers and with Naval Facility Command (NAVFAC). Cornerstone’s competency covers the entire spectrum of traditional building materials—steel, reinforced concrete, masonry, timber, and so on—as well as modern structural technology, such as Fiber-Reinforced Polymer. Cornerstone Engineering, Inc. was also one of 20 Louisville companies named to Inc. 5000’s 2017 list of high-growth companies. Cornerstone achieved 131% growth YOY from 2013 to 2016. The company was also named the GLI Inc.Credible award winner in the Very Small Business category in 2014. Subram accepted the award on behalf of Cornerstone Engineering, Inc. on May 30, 2018 at the CelebrAsian Procurement & Business Conference, in Bethesda, Maryland. USPAACC’s annual CelebrAsian conference brings together over 700 executives from leading Asian American firms, Fortune 500 companies and federal government agencies. Cornerstone Engineering, Inc. (CEI) is an is an award-winning SBA 8(a), DBE, MBE Certified Architectural-Engineering Consulting firm with offices in Kentucky, Indiana and Ohio. Our Team is comprised of a group of creative and focused Engineers, Architects, and Support Staff with well over 200 years of combined experience and have been delivering our uncompromising services to our clients for 15 years. We are committed to accomplishing projects with excellence and integrity. CEI offers a full range of engineering services including analysis and design of structures, assessment and retrofitting of existing structures, structural special inspections, FRP strengthening, construction and project management services among others. In addition to providing high quality civil, structural, and architectural design services, CEI provides specialty modern strengthening technologies such as Carbon-Fiber and Glass-Fiber Reinforced Polymers (CFRP & GFRP). Our competency covers the spectrum of traditional building materials, including steel, reinforced concrete, masonry, and wood. Founded in 1984 as a national non-profit non-partisan organization, USPAACC has been advocating equal opportunities for Pan Asian Americans in the United States. Headquartered in Washington, DC, USPAACC promote and propel economic growth by opening doors to business, educational and professional opportunities for Pan Asian Americans and their business partners in major corporations, government at federal, state, and local levels, and small/minority communities. USPAACC serves as the gateway to Pan Asian American suppliers, information about Pan Asian Americans and the dynamic Asia Pacific and Indian Subcontinent markets. For more information, visit www.uspaacc.com. CEI’s success was also recently published in an article by The Lane Report. If you have any questions about how our services might align with your own services or business needs, please Contact Us here.